The UK government recently enacted the Person with Significant Control (PSC) regime to enhance transparency in order to prevent corporatization for criminal purposes. The regime came into effect on 6 April 2016. This is in line with the international anti-money laundering initiatives and to enhance disclosure regime for beneficial owners. The purpose of the PSC regulation is to make the ownership and beneficiary details of the UK registered companies publicly available in order to combat tax evasion, money laundering and terrorism financing. The Small Business, Enterprise and Employment Act 2015 introduced several regulatory changes to increase the transparency of companies by making it easier to see who owns or controls them. The listed companies are exempted from this requirement because they are subjected to stringent disclosure requirements regarding ownership, beneficiaries and controllers to the regulatory authorities. However, small or unlisted companies were under no such obligation to do so. Criminals tap on this loophole to use complex corporate structures to camouflage ownership and controlling rights of companies to carryout deceitful activities. From 6 April 2016, all UK registered unlisted companies and Limited Liability Partnerships must compile and hold a PSC register. The requirement is applicable to community interest companies, companies limited by guarantee, academy trusts and charitable companies. Although listed companies are exempted their subsidiaries are required to maintain a PSC register. New companies are required to submit this information at the time of incorporation. From 30 June 2016, companies will have to submit this information to Companies House when they file their annual confirmation statement. In the case of companies held by other legal entities, the PSC register of such companies must record the details of the legal entity that fulfil at least one of the criteria for PSC test for individuals, provided such legal entity is “relevant and registrable”. 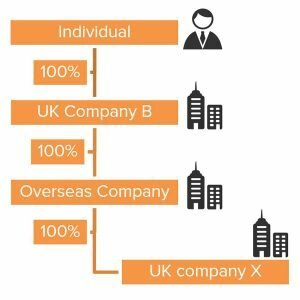 A relevant legal entity could be a UK company or LLP, or non-UK company with voting shares listed on certain markets, that would have been a PSC if it were an individual. 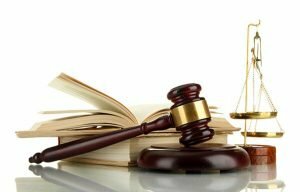 What constitutes a “Registrable Relevant Legal Entity” registrable (RLE)? In case of a chain of entities, in order to be registrable the legal entity must be the first RLE in the chain of ownership. It must be noted that foreign companies, since they are not required to maintain a PSC register, do not constitute an RLE, therefore will not feature in the PSC register of its UK subsidiary. In case of an Individual holding a UK company ‘X’ through a chain of legal entities, whereby every entity in the chain is a UK company, the Individual will not feature in the PSC register of the company ‘X’. Only that RLE that is immediately above, holding the company ‘X’ will be registered as PSC. In this case UK Company C is the registrable RLE that will feature in the PSC register of UK Company X. The individual will feature as the PSC in the PSC register of UK Company B. If an overseas entity is interposed in the chain of entities, the overseas entity is beyond the scope of PSC register. In the given example, the Overseas Company cannot be entered in the PSC register of UK Company X, even though it is wholly held by the overseas entity. Instead the UK Company X must look through the chain of entities until it finds a PSC or RLE or if the entities above fail the PSC test then must determine that there is no PSC or RLE. In the given example, the UK Company B is the registrable RLE that will feature in the PSC register of the UK Company X. The PSC details to be registered are name, date of birth, nationality, country or state where the PSC is usually resident, service address, usual residential address, date on which the PSC became a registrable PSC, nature of the control over the company/LLP and details of any restrictions on using or disclosing the PSC’s information. The RLE details to be registered are name, address of its registered or principal office, legal form and governing law, register of companies in which it is entered and registration number, date on which the RLE became a registrable RLE and nature of the control over the company or LLP. It must be noted that a PSC’s residential address and day of birth will not be made public. A PSC may apply to Companies House for a PSC’s information to be protected, but only on the grounds that such disclosure would put the PSC (or someone he lives with) at serious risk of violence or intimidation. A PSC register cannot remain empty. A UL registered company must take all reasonable efforts to identify the PSC or RLE and if its measures to identify the PSC or RLE are still under progress then the fact must be stated in the PSC register. If no registrable PSC or RLE is identified then this must also be recorded in the PSC. Failure to maintain and update the PSC register will attract legal sanctions against the UK company. A UK company will issue a notice seeking information from the PSC/RLE and the PSC or RLE must respond to the notice within one month. If the PSC/RLE fails to respond to the notice then the UK company can freeze the shares and rights of a PSC or RLE by issuing restriction notice. This will ban the non-responsive PSC or RLE from exercising rights attached, receiving dividends or transfer and sell the share. If your Singapore entity is holding a UK company, the Singapore entity will not feature in the PSC register of the UK Company because it is outside the scope of the PSC/RLE regime. The Singapore company is also not required to maintain a PSC register. However if you, as an individual, directly or indirectly own significant share in the Singapore entity or have controlling rights then you are deemed to be the indirect PSC of the UK company. In such an event your details will have to be recorded in the PSC register of the UK company. 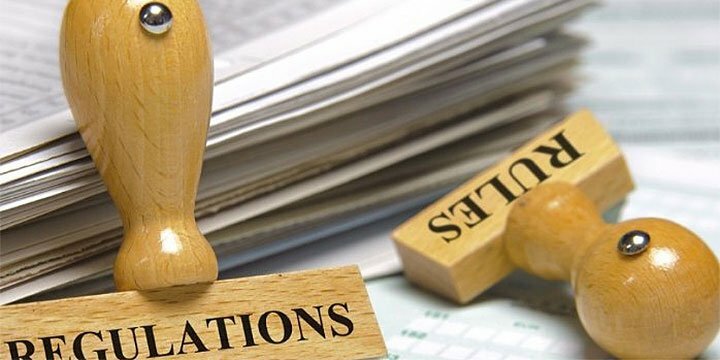 If you believe or aware that you have direct or indirect stake in a UK Company or LLP you must examine your PSC status and your liability to provide information to the subsidiary UK company then you have to appropriately notify and conform your information to be recorded in the PSC register. If required, you may elect for confidentiality of information with the Companies House. If you receive any notice for information from a UK company make sure that you respond to the notice within one month of such notice. Also approach your corporate service provider to examine your business structure to determine your liability under the new regime. If you do not wish to be subjected to such disclosure requirements, then you will have to review your corporate structure and reorganize the shareholding and controlling structure by redistributing your shares and rights. The UK’s corporate transparency measures imposing disclosure obligations on investors, entrepreneurs and enterprises are gaining lot of attention in the wake of the Panama Papers debacle. We anticipate similar measure from other jurisdictions to follow. In the evolving scenario it is important for companies and individuals having multi-jurisdictional business structures to review and assess their compliance measures. We also anticipate a spike in Singapore offshore companies. Singapore has a clean image, political stability and confidentiality provisions. Investors can set up a Singapore company and use the nominee shareholder service to keep their personal detail confidential. The business in the UK can be managed through a branch office in order to bypass the disclosure requirements, but such an arrangement will deprive them of local UK tax privileges. But it must be noted that Singapore and the UK have signed an Exchange of Information (EOI) protocol under their DTA, therefore the provision of nominee services cannot be misused for criminal activities. The Global Forum on Transparency and Exchange of Information for Tax Purposes, the key international body that assesses jurisdictions’ implementation of the international standards on tax transparency, has assessed Singapore’s exchange of information regime as “largely compliant” with the international standard. The noose is tightening around tax evasion and financial crimes. Investors and enterprises have to constantly ensure compliance and implement stringent controls to prevent any legal sanctions that will hurt their cross border business interest.